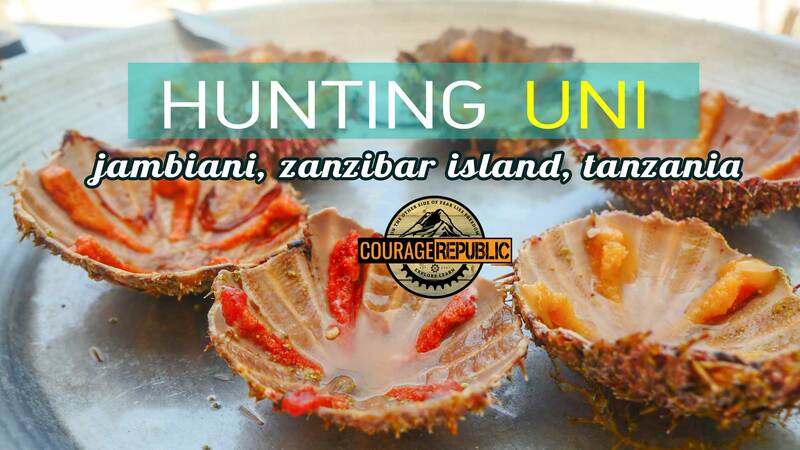 In this episode, I’m all the way out in a village named Jambiani on Zanzibar Island way out on the coast of Tanzania. It’s not a very touristy beach because large sections of the beach are used by locals as a red seaweed farm, mostly exporting to China. This means it’s super quiet and different. MUCH better in my opinion than the zoo at Nungwi. And, I’m using the opportunity to peek at marine life and see if I can forage some food – Raw sea urchins, or uni, in particular. I’m tired of bad and overpriced restaurant food, so I booked an Airbnb with some basic kitchen facilities so I can self-cater. The internet is not so good there, so I just did a quick search on my phone to roughly see which varieties are edible. I know the really spiky ones with the evil sting aren’t edible, but I think I’ve found one edible variety and collect a few to bring back. So, being a newbie, I have no idea on how to open a sea urchin, and the first one is a pathetic fork and knife FAIL. I would have been as successful using a pair of chopsticks. Fortunately, I asked my friend Chief Isaac, who’s a bit camera shy, and moments later, I’m in business. The urchins are totally OK to pick up and hold, and I just gather them by hand later. So, the ones you’re looking for are located further out, are usually reddish with short white spikes and often have a hat of shells, rocks, and kelp. The locals themselves know sea urchins are edible, but they don’t eat them, mostly because it’s too much work for very little pay-off. But for me, being surrounded by so much uni is a once-in-a-lifetime phenomenon for me, so I’m going to go all out. So that was my first experience with preparing sea urchin or uni sashimi. I was a total newbie at the beginning, but as with learning anything, you have to be a fool at first. I took a little sea urchin dismantling lesson from a local chef, and now I’ve got a new skill! I actually got quite good at it and ended up cooking some fusion dishes, so please follow on Facebook and/or subscribe on Youtube to see what’s next!